Welcome back to Beach Week on Just About Baked! I’m celebrating the best of boardwalk treats with my own twists! Have I mentioned that I didn’t grow up anywhere near the water? The closest we came was a three-hour drive to Lake Michigan. It was really beautiful, but I’m more of an ocean beach girl. Something about those crashing waves really gets me every time. 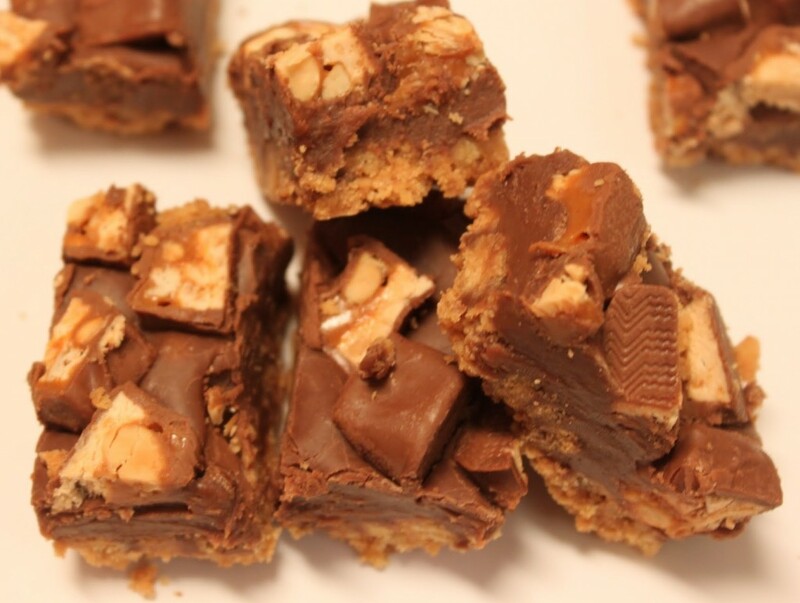 Today is fudge day. One of my priority stops in any beach town is the candy shop, which is usually stocked with thick slabs of fudge in different flavors. They usually have great deals, too, because fudge doesn’t last too long and they need to sell it. It’s a win for everybody! The fudge you see here is not available at the beach, though! You know why? It has a crust. A Nutter Butter crust! And Snickers. I’m almost falling out of my chair. It’s so exciting! For the base, I combined peanut butter chips and milk chocolate chips to get the best peanutty flavor. 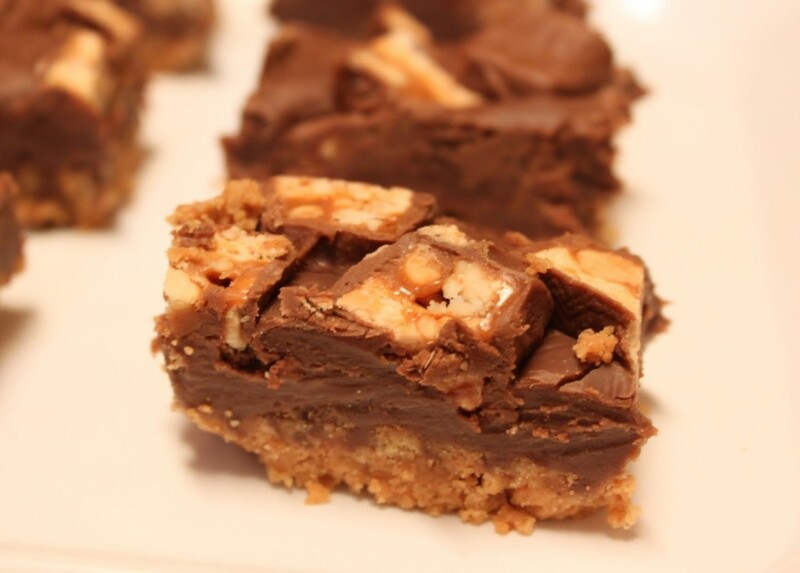 The Snickers bites are chopped in half and added right before chill time, and they melt ever so slightly into the fudge base. It’s heaven in a pan. 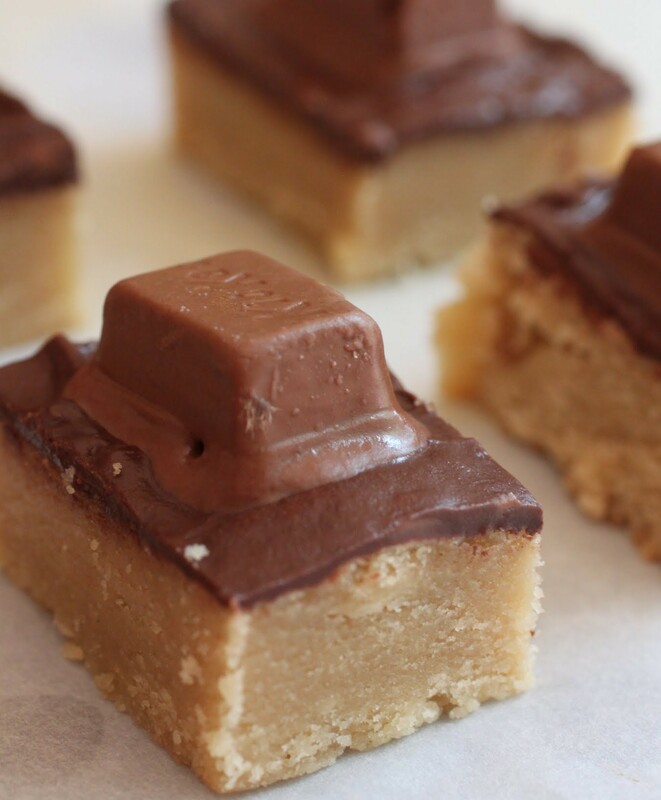 The only danger with this easy fudge is eating too much of it. But isn’t that always the problem? Sigh. I have only one problem with fudge. You can’t freeze it. Or maybe you can. Has anyone tried? Let me know if it works! 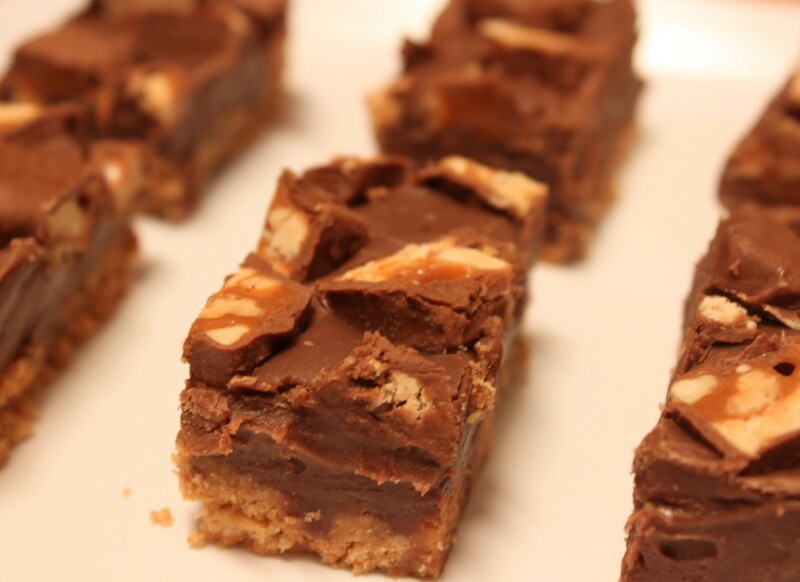 The only thing better than fudge is fudge with a crust. Jump on this bandwagon! And get some beach while you can! It’s the only thing I love more than chocolate. Maybe. Preheat the oven to 350. Coat an 8 x 8 pan with cooking spray. Mix the Nutter Butter crumbs and melted butter thoroughly and press into the bottom of the prepared pan. Bake for 10 minutes and then remove from the oven. In a microwave-safe bowl, melt the peanut butter chips and milk chocolate chips with the condensed milk for 2 and 1/2 minutes. Remove the bowl from the oven and stir the ingredients until smooth. Add the vanilla and stir again. Pour the fudge into the baked crust and press the halved Snickers bites into the top of the fudge. 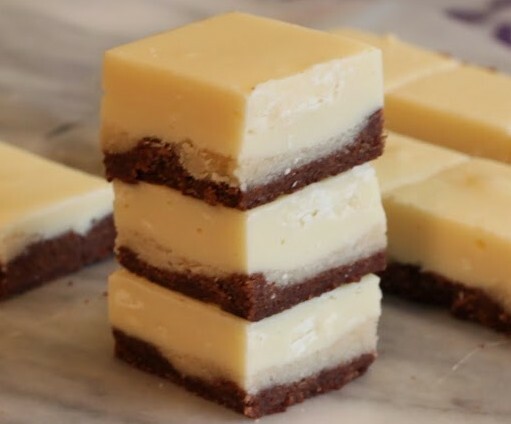 Refrigerate for two hours and then cut into squares. Store in an airtight container. 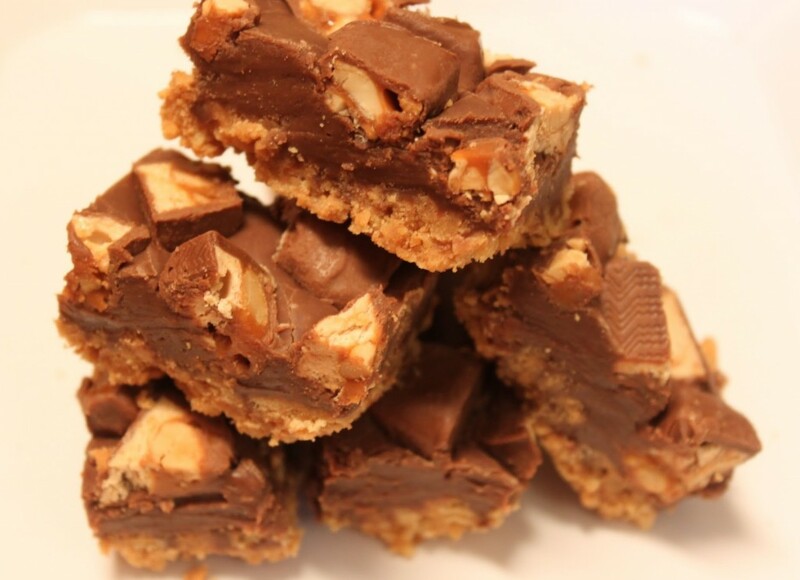 I’ve got your back this week with ideas for how to use your leftover Halloween candy. I mean, duh. Eat it. But if not…bake it! 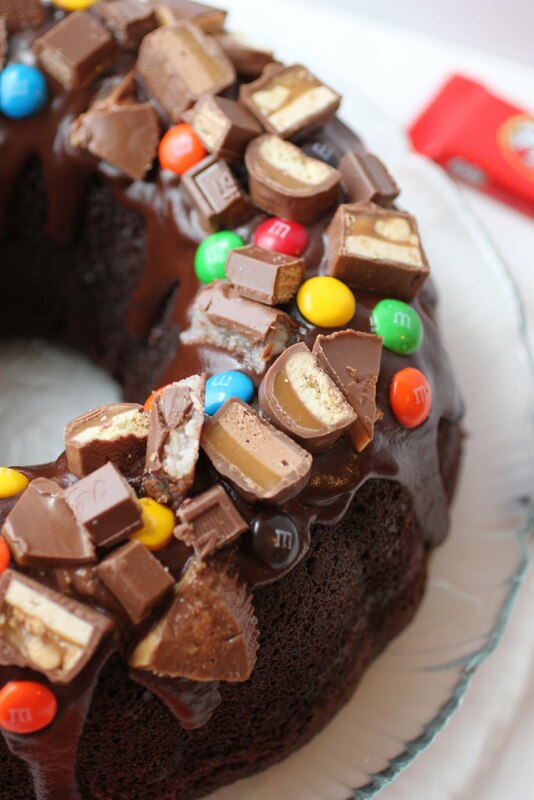 Nothing will please a crowd faster than chocolate cake, and when you add a rich chocolate glaze and cover the cake with all kinds of candy bars, you’re basically asking people to come to your house and never leave. If that sounds okay to you, proceed! After all, nothing will fill a house full of visitors faster than baked goods. I find that when there’s a candy assortment in the mix, you just have to get used to having privacy invaded on a regular basis. Anyone been neglecting the Kit Kats lately? Except me, that is? Well, let’s get that fixed right away. Anything that involves a wafer and chocolate should never be ignored. That goes double for these bars, which exceed the already super addictive quotient of my usual baking fare. Seriously, I couldn’t stop eating these. I tried, too. But no matter how many I gave away or shared, I still had enough to make a dent in the batch. And that is an accomplishment worth savoring, my friends. I’m about to go on a little rant here. Y’all ready? I have very strong feelings about food safety. A few years ago, Nestle released a batch of tainted cookie dough and a few people ate it raw. One woman died. And Nestle closed their plant to clean it and disinfect it, but the bottom line is, somebody made a huge mistake. The same thing has happened with bags of salad mix. I mean, really. Tainted spinach? And peanut butter. How did salmonella get into peanut butter? And of course, eggs and raw meats are always an issue. I love the flavors in this fudge, Mir! And I think I would definitely eat too much of it, but it would be worth it. The nutter butter crust sounds like the perfect addition. Yum! I had to give it away ASAP so I wouldn’t eat it all. Nutter butter crust is apparently quite dangerous! Thanks, Gayle! This looks too too fabulous! This looks really good. I love the sweet, salty and nutty taste. Not just for beach treats. 😛 This would also be great for gifts at Christmas time. Yummy! I always do lots of fudge at the holidays. It’s easy and makes great gifts! I LOVE that you made the crust out of Nutter Butters! Sinful! I live in FL by the water and I never go. Is that a crime? I love fudge so much! And Snickers. What could be better? Definitely a crime! Well, maybe not. But I love the water! Not sure if it would be the same if I saw it every day, though. I wish you lived next door!! I would have stolen all the candy from you hehe!! Send me some!! Me, too! I could use some help not eating it all myself! Are you trying to make me jealous? Like, you can’t just tell me you have fudge with Nutter Butters and Snickers. That isn’t fair Mir, I am drooling … must make this soon. What a winner of a fudge recipe! Wish I could give you some! How fun! I love that you packed these full of good stuff! I never knew fudge was a beach thing until we went to cape cod last year and now I can’t imagine our trip without it. Love the snickers twist! Same for me. I first got fudge at the beach ten years ago and I’ll never go back! 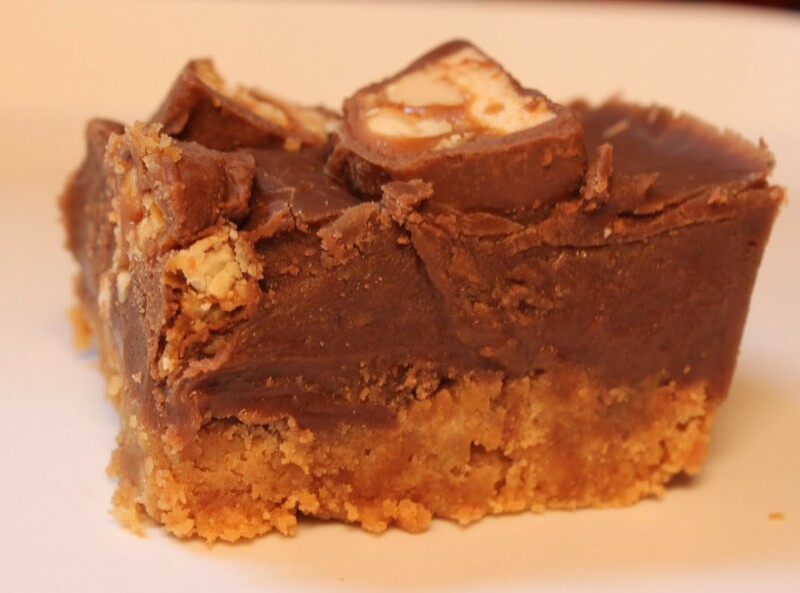 Fudge with a nutter butter crust?! Come to mama!! This sounds incredible, Mir! Just a quick note to let you know that i made your recipe this weekend. It was a big hit. Thanks so much, Lori! That means the world to me. My day is now happier!